Information, story, and photos courtesy of Karen Grant, RN and Rat Guide. Theme, content inspiration, and editing by Gwen Lindsey and Karen Borga. Question: When a rat incessantly tries to gnaw at her bandage or surgical wound, or, like Houdini, walks right out of her wrap, what do you do? Answer: Explore various types of bandaging and wrapping. Try an e-collar. Assess the reasons why the rat is frantically worrying the wrapping and/or the incision. Try different strategies to see if you can address the problem, even if you haven't fully understood the cause. Some suture material can feel so foreign to rats that they feel the need to try and groom it off. Discuss with your vet, prior to the surgery, the advantages and disadvantages of using one type of material (e.g. surgical adhesive, staples, wire sutures) versus another, based on the type and extent of the surgery and where it will be located on the body. Surgical adhesive (a type of glue) is a valuable suture material and has its place with certain types of wound skin closures on rats; however, if when applied it seeps into the wound, it can irritate and set up an inflammatory response. In addition rats may groom off the surgical adhesive, thereby opening the wound. If there is any thought that drainage from the wound will be anticipated or is likely, or that the rat may groom the site in excess, it may be better to use steel clips or staples, or an interrupted type of suturing with steel wire sutures. Rats experience pain in much the same way as humans do. Pain may be more acute with some wounds depending on how involved the surgery is and where it is on the body. A rat may do well with only an NSAID (e.g. Metacam, Carprofen, Banamine) to control pain, but with more involved surgery the addition, or co-administration, of an opioid (e.g., Torbutrol, Buprenex) or a narcotic-like (e.g., Tramadol) medicine may make for a more comfortable rat. Assess the bandage: is the design flawed, does it have poor coverage, is it too easy to get out of, does it interfere with mobility such as eating and drinking, or will urine or feces soil the wrap? The following is Anastasia’s story. Prior to the surgery which is the focus of this gallery, Anastasia had a small mammary fibroma removed from beneath the right forelimb. Dissolvable subcutaneous suture had been used and surgical adhesive was used to close the dermis. No wrap was required and Anastasia never bothered it. Pain was controlled with a dose of Carprofen. Four weeks later another mass, slightly larger than the first mass, was discovered in the left mammary chain, ventral-lateral just above the left hind limb (see arrow to the site on photograph below), and the decision was made to have it removed. This time it required tying off a few more vessels and removing a tiny amount of muscle along with the tumor. Again (as with the first tumor removal surgery) the vet used dissolvable subcutaneous sutures and the dermis was closed with surgical adhesive. Metacam was given post-op, once Ana recovered from anesthesia, to control pain. However, because she continually chewed at the site, we believed pain was still a factor, and so the vet applied a small amount of lidocaine at the site to numb the pain. This too did not seem to help so an injection of buprenorphine was given. While at home and closely observed she seemed to do alright with one additional injection of buprenorphine in the evening for pain. Unfortunately, into the early morning hours she managed to squeeze out of the e-collar and open the wound. The site was immediately cleansed, surgical adhesive was reapplied, and Ana was placed in a semi-restrictive full body wrap (see below), since she had managed to escape a smaller wrap (not shown) previously applied. The hope was that this full body wrap would be needed only a temporarily until pain was more controlled or wound healing begun. "Turtle neck style body wrap". This body wrap is semi-restrictive and should be used only in the event other less restrictive methods are unable to prevent the rat from causing wound disruption. Advised to use only as a temporary measure. (Karen Grant). Supplies: 2-inch self-stick Vetrap (co-flex wrap) or Johnson and Johnson Secure-Flex wrap for covering dressing material. Telfa (comes in various sizes and can be cut to size) to just cover the wound. One-inch Zonas (atheletic) fabric tape. Depending on how large the rat is, fold about 5-8 inches of the Vet wrap in half for going around and over her shoulders (it should look like the shape of a "V" in the front and back of the rat (similar to a vest) so that it does not interfere with eating, breathing or walking, and continue to wrap with the full width in spiral fashion to just above the wound. Place a telfa pad over the wound and then continue the Vetrap in spiral fashion covering the telfa. Apply a piece of Zonas tape to hold the wrap in place. The Vet wrap should not be tightly stretched to wrap around the rat but wrapped to conform with the rat's shape. Allow the ability to get an index finger easily inside the wrap to ensure that it is not wrapped too tightly. This may be applied by one person if the rat is not agitated. Caution: The wrap may be removed when the rat can be constantly supervised. Unwind it into a roll for re-application. Before completely reapplying the wrap, place a clean telfa pad in place. 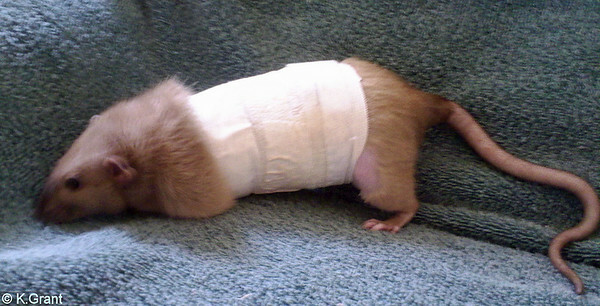 The length of time that the wrap needs to be used will depend upon the extent of the wound, whether the rat is able to tolerate it, until a more modified wrap can be used, or if the rat is able to leave the wound alone once healing has commenced. While in the full body wrap, Anastasia managed to tuck her foot up inside the bottom of the wrap (pictured above). Even though she could easily move her foot in and out of the wrap, she chose to sleep that way. This resulted in the development of lymphedema (swelling of tissue due to retention of fluid in the lymph vessels) in her foot, which resolved once the wrap was removed. Even with the wrap removed and additional pain medication given, and close observation, Anastasia continued to make every effort to try to chew the site. At this point, still at home, a new, resized e-collar was applied, but she again escaped, and again groomed the wound open. We hoped, this time, that the wound was apposed enough (edges close enough together) to permit healing on its own, but unfortunately that was not to be because Anastasia was obsessed with the wound. A modified wrap like that seen below was applied prior to transporting to the vet, where the wound was cleansed, and staples instead of glue were used to re-close the wound. 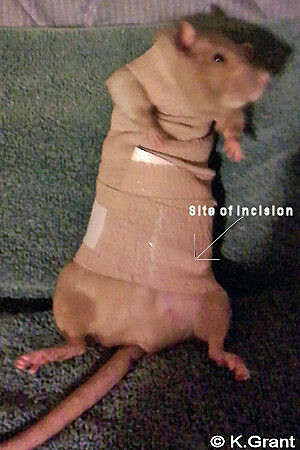 The vet applied the same type of modified wrap as seen below using tape to anchor the wrap to the fur so it could not be pulled off. This final modified bandage did the trick. Anastasia became much more comfortable and did not bother the dressing or the wound site. We believe that because the final surgery was slightly more involved, her discomfort had been increased. This, coupled with her increased sensitivity to the surgical adhesive, had resulted in her incessant attempts to get at the wound. Supplies: 2-inch self-stick Vetrap (co-flex wrap) or Johnson and Johnson Secure-Flex wrap for covering dressing material. Telfa (comes in various sizes and can be cut to size) to just cover the wound. One-inch Zonas (atheletic) fabric tape. See How to Do a Post-Op Bandage on a Rat, for Lindsay Pulman's directions on anchoring the wrap to fur. In the modified version, the Vetrap is started about 2 inches behind the forelimbs and spiral wraped to just above the wound. A telfa pad is placed across the wound and taped gently, and the Vetrap is continued in a spiral fashion just over the wound site and slightly below. Zonas tape is applied circumferentially to both the rat's fur and the wrap at the beginning and end of the wrap. Both the Vetrap and Zonas tape are applied to just conform with the shape of the rat. Before applying tape ensure that there is enough room between the rat and the wrap to insert one finger. 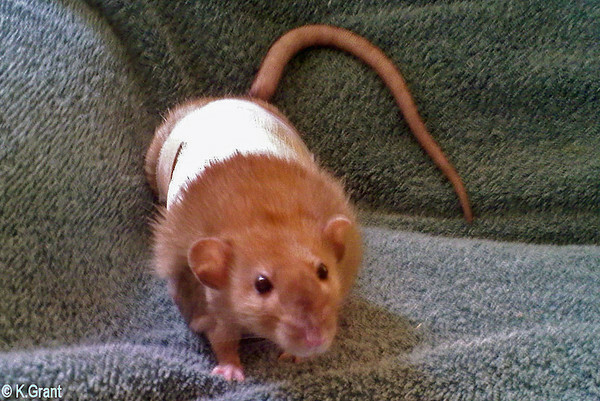 This type of wrap may be used until the rat does not disturb the suture material or disrupt wound healing. The rat can eat and drink, and sleep comfortably in this type of wrap. Caution: Any wrap or dressing should be changed immediately if the rat's breathing becomes labored, or the bandage becomes soiled, or swelling, drainage, foul odor, or changes in the rat's behavior with eating, drinking, or mobility are noted. A complete set of instructions by Lindsay Pulman for a body wrap using anchor tapes can be found in the JoinRats gallery, How to Do a Post-Op Bandage on a Rat. View a video of a veterinarian bandaging a pet rat here, Basic Demonstration: Bandaging Rossi, and view other photographs of Good Bandages, Problem Bandages, and Workable But Mediocre Bandages. 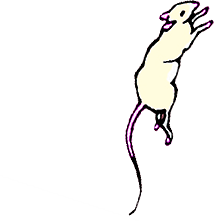 Visit Rat Guide for all things health related for your pet rat, including First Aid Supplies and Figures. This set of instructions is not designed to diagnose the need for a bandage for your rat's incision or wound; it cannot be used to identify which bandage your rat needs; and, as described, does not include steps to adequately help you successfully apply a bandage on your own. 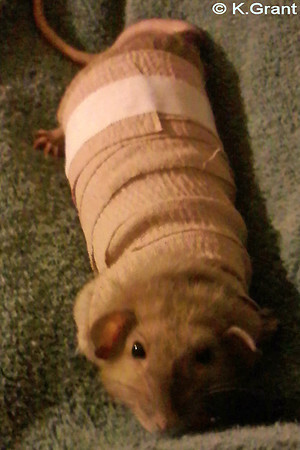 Please see a veterinarian to diagnose your pet rat, and to determine the need for a bandage. Ask a veterinarian for assistance in applying a bandage properly. Improperly bandaged rats can suffer from immobility, difficulty breathing, inhibited appetite, fluid intake, and elimination. Any wrap or dressing should be changed immediately if it becomes soiled, or if drainage, foul odor, swelling, or changes in the rat's behavior with eating, drinking, or mobility are noted. JoinRats, Rat Guide, Karen Grant and associates assume no responsibility for the misuse or misunderstanding of the information here, and make no guarantees with respect to results that may be obtained from the uses, procedures, or recommendations listed within this article. The information in this gallery is strictly for educational and informational purposes only, and does not replace qualified care by a veterinarian. 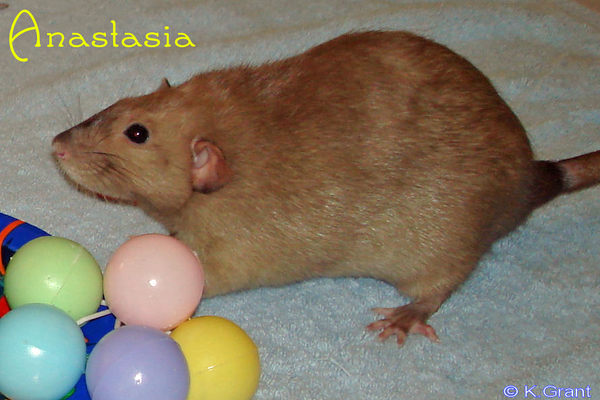 Anastasia is a remarkably calm, sweet, 2 year old, intact, Burmese female rat. Her previous history includes a mild respiratory infection at 12 months old, as well as pneumonia and constipation at 18 months old, all of which were treated. Due to Anastasia's history she remains on antibiotics, which in her case was of great benefit in her wound healing as well. Anastasia healed without incident. Anastasia models her beauty before her surgery adventures. Thanks to Karen Grant and courtesy of Rat Guide for permission to host.